← Flickr blog is powered by WordPress.com, who knew? Some of my most treasured “possessions” are the film programs I have collected from innumerable film outings over the years. I have a modest collection of stuff spread across several boxes in my attic, and I do love to steal away for a while and look through these memories that encapsulate so many of my fondest memories. Film is first and foremost a memory machine for me. It helps me track moments in my own development and re-project my own understanding of days gone by, however filtered and fallible. But I think we all know that the emulsion of memories is a less than perfect science! That being said, I was looking through my Brooklyn Academy of Music programs from about 2002 through 2005 and I was further reminded of just how amazing the programming at the BAM is. You wanna know what makes a great city? Just take a look at a cultural center like the BAM which consistently delivers some of the most unbelievable access to the culture of film (not to mention theater, dance and music) within a sharp international frame. I just can say enough amazing things about the level of culture that a place like the BAM brings to a city. I think in the midst of developing our consumer inspired nightmares such as the ubiquitous strip malls, box stores, and cineplexes, we have forgotten the very reasons why we were put on this earth. It is certainly not simply to mate, feed our basic instinct, or shop ’til we drop -we were meant to create and watch films, movies, motion pictures, what have you. Three thousand years of culture led us to this moment, and the second we forget it -that is when we return to the primal ooze and cease to be imaginative figures of mirrors and light. Ok, but that is not why I am writing this post, rather I am experimenting a bit with cleaning out my attic and sharing some of my experiences that are deeply personal, while at the same time unbelievable guides to a curriculum (self-directed or otherwise) for film, or even valuable for fueling ideas for incorporating film into various disciplinary approaches to teaching and learning). To this end, I have created a flickr account for bavatuesdays (distinct from my personal account which is just a baby fest) that will act as an archive for all of the various sediments of my short and feeble history as a collector of film programs. If I go through them too quickly, I might have to bust out my Weebles’ Haunted House or my comprehensive Smurf collection or even all my AD&D paraphernalia 😉 But, I’ll start with the stuff that I think might prove useful to anyone already interested in film, or particularly interested in getting an education in film. The first series of sets I will work on getting up, and possibly the most robust sets I have, are the BAM’s bi-monthly film programs. I have many, many more from my years in both NYC and LA, but none of them are as comprehensive as my BAM collection. 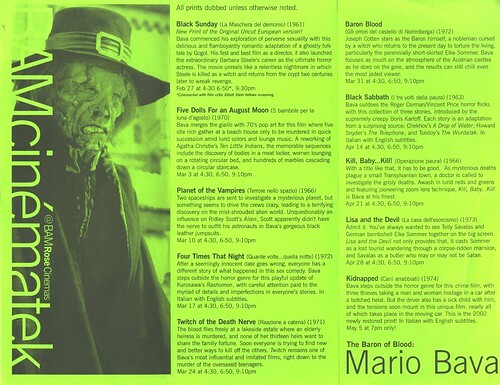 What I particularly love about the programming of the BAM is that within a single day, or across a series of days you might have access to a film like Mario Bava’s Black Sunday followed by a classic of French New Wave cinema, or a little know b-movie from the Nigerian film industry (currently the largest in the world!). The programming makes connections by juxtaposing unlikely relationship that force you to think about film in all sorts of exciting ways. I could go on forever about the genius that is the BAM’s Rose Cinema, but I’ll stop there for now. This is a set of film programs from the Brooklyn Academy of Music in NYC. The BAM has one of the most impressive film programming in existence. The monthly calendars included in this set reflective the thoughtful conceptualization of film that may very well suggest the most intelligent range of thinking film in all sorts of amazingly complex and interesting ways. I think of this sets as a learning resource for the student of film. A guide with which to approach and unbelievable cool and varied selection of great films. And you will not be surprised to find out that as of now there is only the “Mario Bava: The Barron of Blood” retrospective that may have very well been the most enjoyable and exciting experience I have ever had (outside fathering, husbanding, Star Wars, yadda, yadda, yadda -you know the drill). I plan on scanning and uploading this stuff on a somewhat regular basis and blogging it in order to not only capture the experience for me, but also to give my own ideas about why these combinations may prove generative. More importantly, I think the folks who have programmed these retrospectives at BAM are in many ways re-framing a whole theoretical model for looking at film, and it may be worthwhile to spend some time exploring that. 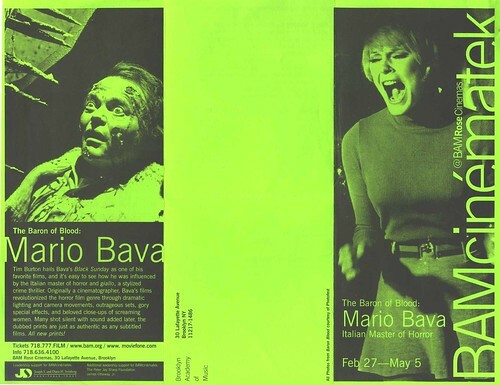 This entry was posted in film and tagged aesthetics, BAM, bavarchive, blogging, brooklyn, Brooklyn Academy of Music, Flickr, horror, mario bava, teaching. Bookmark the permalink. 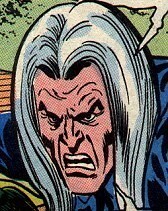 Three little words, Jim: Bring It On.